Stacking chairs suit virtually any setting. 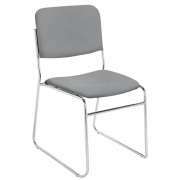 Where can you find stackable seating? 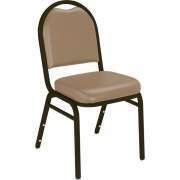 Whether you are looking for classy temporary seating for your church, school or office, the stackable chair option is always available at Hertz Furniture. Easy setup, cleanup and transport make this space-saving solution worth considering. 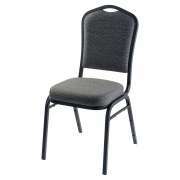 Hertz Furniture&apos;s huge selection of banquet chairs includes a variety of colors, fabrics and designs. 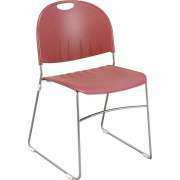 Whether you are looking for fabric, vinyl or plastic stack chairs we have a number of excellent options for you. With such a wide selection, you are sure to find a number of great choices that fulfill your needs. Should I get padded stacking chairs? If possible, you should strongly consider the padded option. 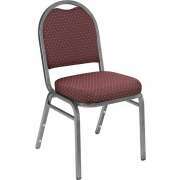 Upholstered stacking chairs are great because they offer enhanced comfort and support. 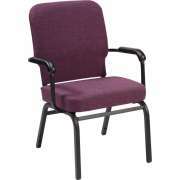 You can choose from vinyl or fabric upholstery in a selection of colors and styles. Vinyl upholstery is the low-maintenance option because it is easy to wipe down between uses and does not rip easily. Padding thickness is an important determinant of stacking chair comfort. Cushion thickness can greatly impact the comfort of your guests and how long they will want to stay seated. Both seats and backs come with varying degrees of padding, so you can choose the ideal padding thickness for your particular purposes. 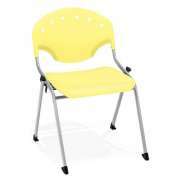 What are the benefits of plastic chairs? Not all stacking chairs have to be padded. Non-padded plastic options are also available. Plastic has many advantages. It is often lighter weight, easier to clean and highly durable. If something spills on a plastic chair, you don&apos;t have to wait for it to dry, you can simply wipe it up so it is ready to use again on the spot. You don&apos;t have to compromise on appearance if you choose the plastic stackable chair option. 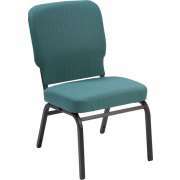 Plastic chair seats and backs come in a wide selection of colors that can be coordinated to your sanctuary, auditorium or cafeteria. 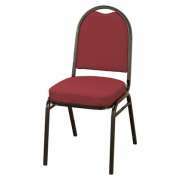 The style of stack chairs also varies in terms of arms and bases. 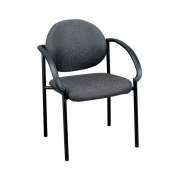 Options are available both with and without armrests. Armrests offer increased support, but they also take up more space. Some of our models have detachable arms so you can choose whether you want them based on what you generally use your banquet chairs for. 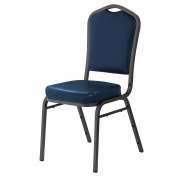 Having the option of adding or removing arms is always ideal because you might be using your stackable chairs as classroom seating one day and church chairs the next, so you want to be ready for anything you can possibly use them for. What kind of base should my chairs have? 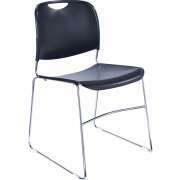 The optimal base style for your stacking chairs depends on what purposes you need them for. Sled bases are a good option for carpeted floors because they minimize damage to rugs when chairs are dragged or moved. 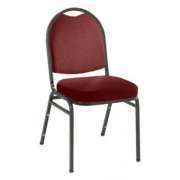 Therefore, they are a great option for use as sanctuary seating. Of course, there is the classic four-legged option which is better for hard floors such as wood or tile. We have both wood-based and steel-based chairs. Some options even come with casters for easy mobility. How high can I stack chairs? 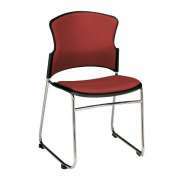 The obvious advantage of stacking chairs is that they can be stacked high for more efficient storage. 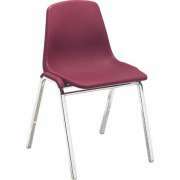 However, not all stack chairs can be piled high in the same quantities. Many of our models come with an optional chair dolly accessory. Chair dollies often enable chairs to be stacked higher than when they are simply on the floor. A chair dolly offers the added convenience of smooth rolling transport from one place to another. Should I get chairs with ganging? 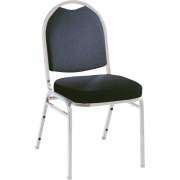 If you want to use your stacking chairs as church pews or rows of auditorium seating, it&apos;s a great idea to get chairs with ganging capabilities. Some of our models come with built-in ganging, and many others have optional ganging accessories. Ganging helps you create neat and straight rows which gives your temporary seating a more permanent look. 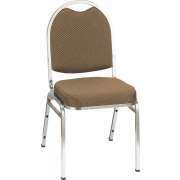 Hertz Furniture has great stacking chair recommendations for you, whether you just need a few extra seats, or you need to fill a whole auditorium. Our stacking chairs come from leading vendors such as KFI, National Public Seating and OFM. 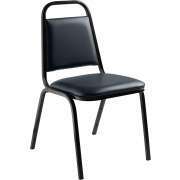 When you invest in stackable chairs from Hertz Furniture, you can be confident that they will serve you well for many years. Many of our models come with extended warranties for many years of worry-free use.